WHENEVER AND WHEREVER YOU THINK OF ORIENTAL DELICACLES, THINK OF VE WONG PRODUCTS. Since 1959, we have been producing foods, drinks and seasonings for both domestic and export markets in over 85 countries in the world. With five plants (2 in Taiwan, the other 3 overseas), we have served our customers with quality, convenient, and healthful products. 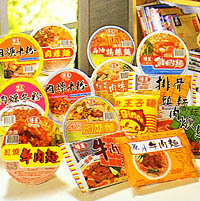 Our product lines: Instant Noodles in polybags, metallized bags, and bowls with and without retort pouches (also known as soft tins); Instant Soup, Monosodium Glutamate (MSG), IG-enriched MSG, Soup Base Seasonings, Spices Powder Mix, Soy Sauce, Canned Fried Gluten, Canned Mixed Porridge-Chinese Style, Canned Drinks (of asparagus, lemon tea, peach, guava, orange, mixed fruits & vegetables, winter melon, honey herbal jelly, paochong tea, barley, etc. ), Pre-cooked Fast Foods-Chinese Style (in retort pouches), and Mineral Water in PET Bottles. With four distribution centers and 25 sales offices strategically located around Taiwan, we have built up a strong sales network for our own products and imported ones such as Canada's canola cooking oil, Japanese shochu (spirits) and Alaskan pure glacier water which originates from the last unpolluted frontier--Alaska, USA. 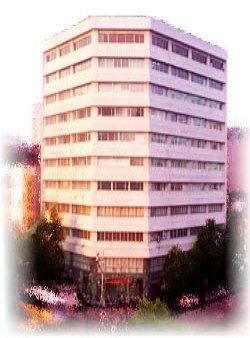 Our company was founded in April, 1959, starting with the production of MSG. In 1966, the company enlarged its capital for both expansion and overseas investment in Thailand, Vietnam and Indonesia for MSG production. Since 1970, the Company has diversified its product lines into The Instant Noodles, Canned Drinks, Soy Sauce, and Retort Pouch Foods. Thus it has ranked among the leading food companies in Taiwan. Ve Wong (means "king of the flavors"), A-One, Vihuongto (means "savory essence"), Champion, Prince, Kung-Fu, Kim Ve Wong, Rarity, and Hot of Hots. In 1996, we set up a joint venture "Summit indutsrial Co., Ltd." with Japan's Fujimori Kogyo Co., Ltd. for producing and marketing the food-related packaging material in Taiwan. In October, 1997, our company was reorganized into five business divisions--Food, Trading, Construction, Automobile and General Development. It was the first time the Company was ever diversified into nonfood sectors. In August, 1998, P.T. Ve Wong Budi Indonesia came on stream for MSG production. In 2001, the automobile businese was closed. And in 2002, our company was awared Quality Assurance Certification -ISO-9001. If any further information is needed from us, your enquiry will be most welcome.